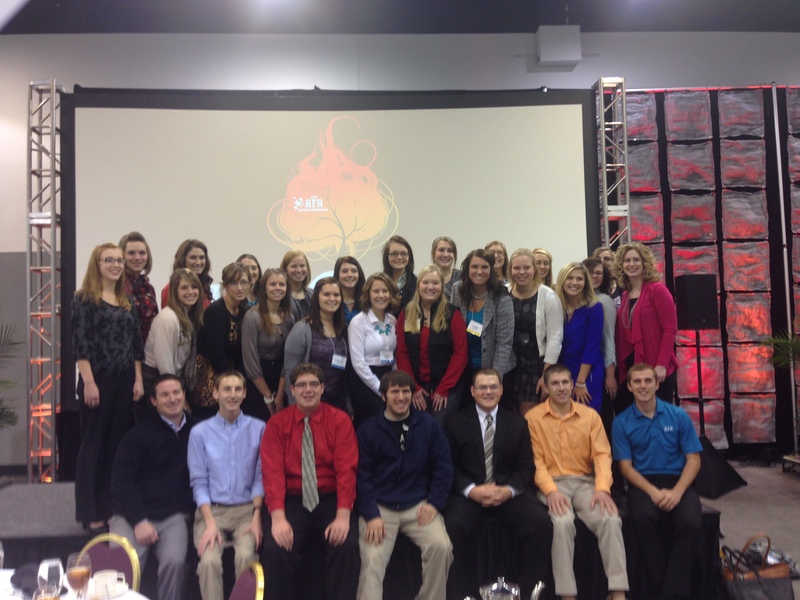 Columbus, Ohio – On Thursday, November 7, 29 students from The Ohio State University traveled west to Kansas City, Missouri to take part in the Agriculture Future of America Leaders Conference. The AFA Leaders Conference provides support for college men and women who are preparing for careers in agriculture-related fields, while at the same time supporting the development of human capital for the agriculture and food industry. Leaders Conference bridges the gap between academic, leadership and work experiences while helping students understand the impact of their decisions. The conference also assists students in developing personal and professional skills necessary for lifelong success and provides a forum for updates and discussions on industry trends. Students are given the opportunity to network with peers and leaders in the agriculture industry as well as increase their excitement about the future of agriculture by creating awareness about career opportunities. After arriving at conference, students heard from many phenomenal speakers, including Bob Treadway of Treadway & Associates, Inc., Joel Mathiowetz of Mathiowetz Family Farms, Erika Poppelreiter with U.S. Farmers & Ranchers Alliance, Adam Carroll with National Financial Educators, Orion Samuelson, American broadcaster, and many more. As a service project while at the conference, AFA delegates also partnered with Numana to package soup packets to send to those in need across the world. Delegates exceeded their goal of 30,000 packets and reached 32,400 packets. A featured session of Leaders Conference is The Leaders in Agriculture Awards Dinner. The AFA Leader in Agriculture Award is presented annually to two individuals who have made significant contributions within the food and agriculture industry and have a track record of supporting career and leader development for young men and women in agriculture. Each award honors an individual whose accomplishments, personally and professionally, distinguish him or her as a mentor to young leaders in the agriculture industry. This years recipients were Vanessa Kummer, previous President of United Soybean Board and the first female president for the organization, and Bob Stallman, who currently serves as the President of the American Farm Bureau Federation. This year, seniors Seth Erwin and Caroline Weihl represented Ohio State on the AFA Student Advisory Team. Applications are currently available for the 2014 team. The recognized leaders begin meeting in March to start planning the conference and meet with industry professionals and AFA partners throughout their term. The conference ended with keynote speaker, Temple Grandin. Dr. Grandin is a designer of livestock handling facilities and a Professor of Animal Science at Colorado State University. She has designed facilities that are now located in the United States, Canada, Europe, Mexico, Australia, New Zealand, and other countries. Grandin has greatly benefited the industry through her research including her writings on the flight zone and other principles of grazing animal behavior that have helped many people reduce stress on their animals during handling. She has also made great strides in the development of a scoring system for assessing handling of cattle and pigs at meat plants, cattle temperament, environmental enrichment for pigs, reducing dark cutters and bruises, bull fertility, training procedures, and effective stunning methods for cattle and pigs at meat plants. Dr. Grandin gave a phenomenal presentation and advice to the young agriculturalists in attendance. Grandin challenged the delegates to think from the bottom up instead of the top-down. She says, “There’s a fantasy in [Washington] D.C. that you can separate policy from the work going on in the fields.” Grandin explained to delegates that “big ag” and “little ag” need to stop attacking each other for the industry to move forward. Her comment that received the biggest applause was that she wants to see “Undercover Legislature” instead of “Undercover Boss.” As she closed the conference, her last piece of advice was for students to go see things and find out what’s really in the field. This year’s conference was a great success for Ohio State not only in an increase in delegates but by recognition at the conference of our outstanding students and the position to which they have been elected. Not pictured: Victoria Bruns, first year Greenhouse and Nursery Management ATI.